So what’s the verdict? Is it gonna be better than Crush or a dud? Move over, Justin Bieber, there’s another pint-sized singing sensation on the scene! David Archuleta might be short in stature but he’s certainly not short on talent. This crooning cutie rose to fame with the help of not just one but two star-making making machines: Star Search and American Idol. The Utah native claimed the title of Junior Vocal Champion at the age of 12, and while he might have only come in second to David Cook two years ago on American Idol, his success in the music industry is second to none. 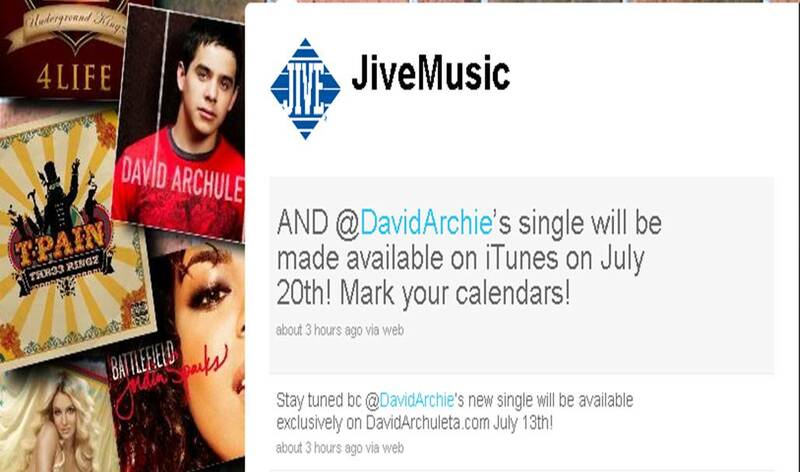 Shortly after his run on American Idol, David Archuleta released his self titled debut album. The album itself went on to sell over half a million copies, while the lead single ‘Crush’ became one of the biggest hits of 2008, moving 1.8 million downloads. And late last year, he released a Christmas album which included covers of yuletide favorites like ‘Silent Night’, ‘O Holy Night’, and ‘Ave Maria’. These days, David is hard at work in the studio working on a follow up record. The teen heartthrob is working with some of the same great writers and producers, like Emanuel ‘E-man’ Kiriakou, who helped craft his debut, but he says he wants his follow up to be a bit more grown up. 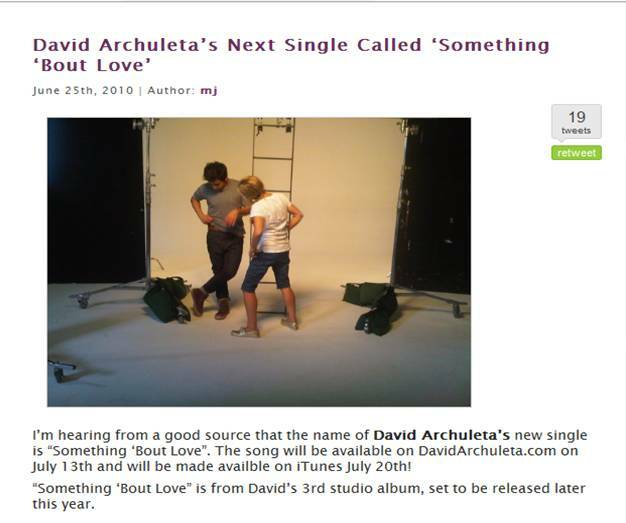 According to his blog on DavidArchuleta.com, he’s taking the reigns by writing more of his material this time around as well. He told the L.A. Times earlier this year, ‘Lyrically, I just want it to sound more like me. I want people to say, ‘This is David talking.’ Instead of just interpreting.’ David obviously knows what he wants, and it sounds like a recipe for success! 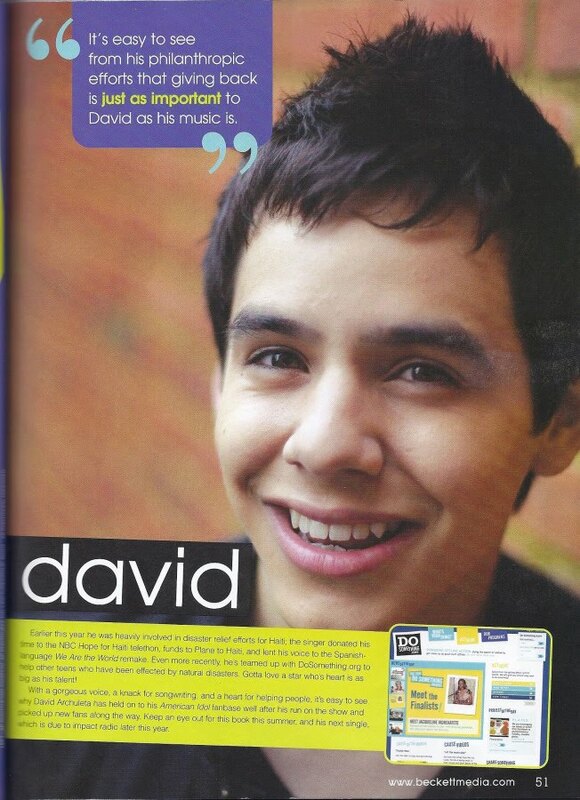 A new album isn’t the only thing on the horizon for David Archuleta. He’ll soon be able to add the title author to his long list of credits when his book Chords of Strength hits shelves this June. Even though David was initially hesitant to write a memoir before his 20th birthday, he decided the book would be a great way to answer some of the questions he’s frequently asked about his life by fans. The book is slated to cover David’s rise to fame and how he overcame the odds. It’s easy to see from his philanthropic efforts that giving back is just as important to David as his music is. -In 2005, David suffered vocal paralysis and had to undergo risky surgery on his vocal chords. 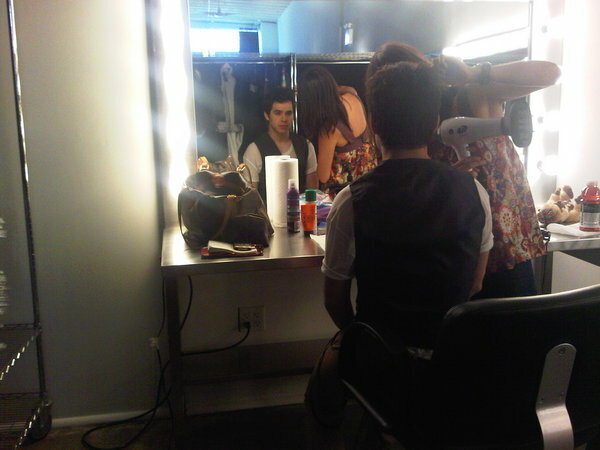 -David gets his vocal chops from his mother, Lupe, who is also a singer. Anywayzz Rizky Adriyani emailed this cover of David’s song by an Indonesian Archie called Mialiani to AAM. It actually works better with a slower tempo. Good job Mialani! Album photo shoot in NYC; Single release July 13th!!! He looks a lot older than his 19 years. That wind blown hair gives him an air of maturity. Could this be the new single? Great recap from Rexburg show! I’m a 28-year-old male. My musical tastes include Keane, U2, They Might Be Giants, Regina Spektor and Broadway soundtracks. 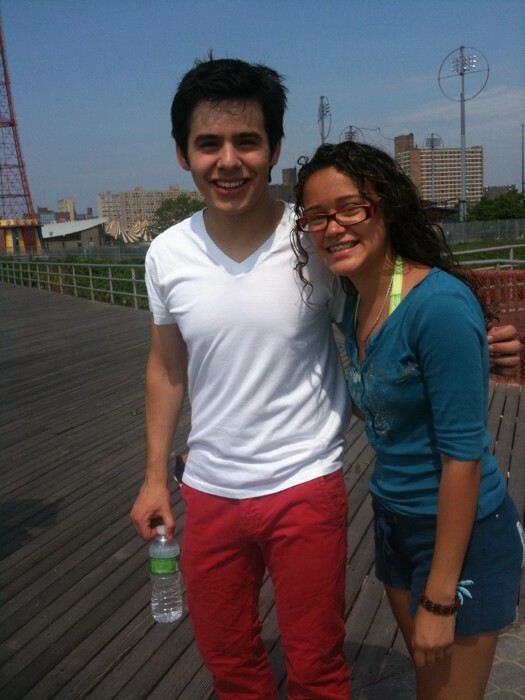 I am not what I would have called a typical David Archuleta fan. And even though I have interviewed him twice, and met him twice more, I had never, until Saturday night, heard a single song sung by him. I interview a lot of artists and bands, and most of these interviews come with the opportunity to attend their respective concerts, take photos for the paper, etc. I rarely attend these events, mostly due to time. 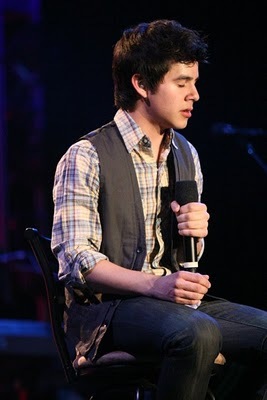 However, I so enjoyed my interactions with Archuleta this past week that I decided to take my wife to his concert. “Why did I do this?” I asked myself as I sat through a particularly not enjoyable pre-show. When the screaming started (true to Archuleta’s own words, the loudest he’s ever heard) I was even more outside of my comfort zone. Thankfully, I was “taking pictures for the paper,” which made my front and center position less awkward and noticeable. But what was my surprise when this “American Idol” star, an accolade I often scoff at, opened with what I can only describe as a fun, truly enjoyable song. And lo, the second song was even better. My expectations of weak vocals and cheesy, teen-pop lyrics fled, and I sat back to enjoy the show. But more impressive to me than his performance were the traits he exhibited in our interaction during the week, the very traits that prompted me to attend his concert. Trait No. 1: He’s a regular, even humble, kid. When speaking of the release of his new book, Archuleta had no assumption of his own great wisdom or experience. Instead, he said the publishers approached him, so he thought maybe, since he has been a teenager, his experience with trials and overcoming might speak to other teenagers and help them out. While I saw for a fact that many nonteenagers were buying his book, Archuleta held no illusions for himself of trying to be profound to an older audience. Trait No. 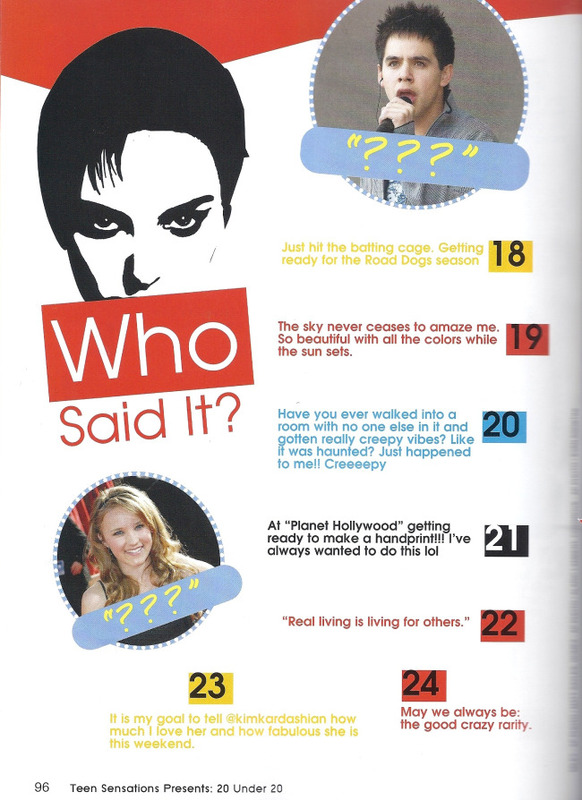 2: He’s loyal to his fans. When I asked the manager at Deseret Book how long Archuleta would be signing books last Thursday, he told me it started at 6 p.m.
“When does it end?” I asked. “When all the books are signed,” he replied. The manager went on to say that Archuleta personalizes each book he signs, something most artists don’t take the time to do. From the look of things, Archuleta has a strong enough fan base to get away with just signing books from 6 to 8 p.m. So why go the extra mile? I guess he really appreciates those that have made him who he is today, and hasn’t forgotten it. Trait No. 3: It turns out he really can sing. What’s the lesson learned here? I guess it’s that hordes of young ladies and women falling over the pop icon with dreamy eyes and a magical voice can’t always be counted on to be irrational and lacking in real musical inclinations. It turns out, every once in a while, the hype is dead on. To the one and only Lilyyyyy! I’m pretty bad at words, so all I just wanna say is, thank you for being the buddy, kind soul, humble person that you’ve always been. You are very much like that-special-someone we all love. And i am once again reminded of how blessed i’ve been and glad i am to have a friend who not only grew up and went through different phases of life with me, but who are one of those special people who understands and relates to someONE very close to my heart and i can pretty much say that without your help and support, AAM wouldn’t have been born. So thank you, dear friend! Have a wonderful, fantastic year ahead!